Ich bin inzwischen am Palau de Congresos in Barcelona angekommen – dort findet das EMBO Meeting statt. Das einfachste ist, sich ein T10 Metroticket für 10 Fahrten zu kaufen und mit der grünen Linie 3 zum Veranstaltungsort zu fahren. Für das Meeting bei der Endstation Zona Universitària aussteigen und den blauen EMBO-Füßen folgen. Einer davon hier im Foto. Die grüne Linie 3 zieht sich durch die ganze Stadt Barcelona und da ich selbst in Barcelona beheimatet bin, hier ein paar Tips zu Sehenswürdigkeiten an der Linie 3 und zur Anreise zum EMBO-Meeting. Zona Universitària ist also die Endstation und der Ausstieg für das EMBO-Meeting. Drei Stationen weiter, bei Les Corts, ist die Haltestelle für das Stadion des FC Barcelona, das Camp Nou, in dem sonst die halbe spanische Nationalmanschaft plus Messi dem Rest des Landes und vor allem Real Madrid zeigen, wie man Fußball spielt. Es folgt der Hauptbahnhof von Barcelona: Sants Estació. Von dort fahren die meisten nationalen Züge, sowie regionale, zum Beispiel in Richtung Blanes, die Coste Brava hoch. Die Haltstelle España liegt am Plaza España, dem ersten Stop des Shuttlebusses vom Flughafen auf dem Weg in die Innenstadt. Wer also dies hier liest bevor er anreist. Das ist der schnellste Weg vom Flughafen zum EMBO-Meeting mit öffentlichen Verkehrsmitteln: Flughafenbus, erste Haltestelle aussteigen, Linie drei in Richtung Zona Universitária. Wer bei der Halteselle Paral.lel aussteigt, und in den Funicular (die Seilbahn) zum Montjuic umsteigt ist noch 250 m von der Fundació Joan Miró entfernt. Neben der Dauerausstellung mit Werken von Joan Miró ist derzeit eine tolle temporäre Ausstellung von Pipilotti Rist zu sehen. Videoinstallationen mit Kissen auf dem Boden. Zwischen Kunst und Chill-out und eine ideale Auszeit vom Meeting. Linie 3. Click aufs Bild öffnet es in größer in einem extra Fenster. Die Stationen Drassanes, Liceu und Catalunya sind die drei Innenstadt-Stationen und. Sie liegen auf einer Linie mit der Rambla. Wer abends ausgehen möchte: Hier aussteigen. Mit Blick zum Meer ist rechts von der Rambla das Viertel Raval, links das Gotico, und wer das gotische Viertel durchquert kommt in das Born. Überall Bars und Restaurants. Ein Wort der Warnung: Barcelona ist keine gefährliche Stadt. Taschendiebstahl ist aber weit verbreitet. Also: In der Metro, auf der Rambla und in touristischen Bars und Restaurants die Geldbeutel und Kameras festhalten und auf Rucksäcke, Laptops und Handtaschen achten. Wer sich für den katalanischen Künslter Antoni Gaudí interessiert, sollte am Passeig de Grácia und bei Vallcarca aussteigen. Am Passeig de Grácia findet man das Casa Mila (oder La Pedrera) sowie das Casa Batlló, zwei der bekanntesten Gaudí-Häuser. Von der Haltestelle Vallcarca führen Rolltreppen zum Parc Güell. Der von Gaudí designte Park über den Dächern von Barcelona ist Weltkulturerbe und am Wochenende von Touristen heillos überlaufen. 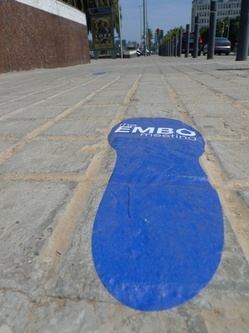 The EMBO-Meeting is taking place near the terminal stop of the green Metro Line 3: Zona Universitària. The Metro line runs through the whole city of Barcelona and in close proximity to many of its stops are sights. Here now an overview of what you can expect if you get off on the way. By now I have arrived at the Palau de Congresos in Barcelona, where the EMBO-Meeting ist taking place. I bought a T10 Metro ticket for ten rides and used the green metro line 3. The easiest way to get to the confrence venue. Get off at the end of line (Zona Universitària) and follow the blue EMBO-feet. One of those can be seen in the photo. The green line 3 runs through the whole city of Barcelona – and because I myself am living in Barcelona, here some tips concerning places of interest near line 3 and also regarding the journey to the EMBO-Meeting. As mentioned before, Zona Universitària is the terminal stop and also where you have to get off in order to reach the EMBO-Meeting. Three stops down the route, at Les Corts, you can get off if you want to see the stadium of the FC Barcelona, Camp Nou, where normally half of the Spanish national team plus Messi show the rest of the country (especially Real Madrid) how to play football (soccer). One of the next stops is the central railway station of Barcelona: Sants Extació. From there most of the national trains as well as regional trains depart, for example towards Blanes, travelling parallel to the Costa Brava. The stop called “España” is located at the Plaza España, which is the first stop of the shuttle bus going from the airport to the inner city. So, to anyone who reads this prior to arriving: This is the fastest way from the airport to the EMBO-Meeting using public transport; airport bus, get off at first stop, line three to Zona Universitària. Everyone who gets off at Paral.lel and transfers to the Funicular (the cable car) to the Montjuic is only 250 m away from the Fundació Joan Miró. At the moment – besides the permanent exhibition containing works of Joan Miró – there is a temporal exhibition concentrating on Pipilotti Rist. Video installations with pillows on the ground. Something in between art and chill-out and an ideal way to take a break from the meeting. Drassanes, Liceu and Catalunya are the three stops in the inner city. They are located alongside the Rambla. Everyone wanting to go out in the evenings: Get off here. If you face towards the sea, you will see on the right hand side of the Rambla the quarter Raval, on the left is the Gotico and if you cross the gothic quarter you will enter the Born. There are bars and restaurants everywhere. One word of caution: Barcelona is not a dangerous city. However, there are many pickpockets, so when you are in the metro, on the Rambla and in touristy bars and restaurants, keep your wallets and cameras close and watch your rucksacks, laptops and purses. Anyone interested in the Catalan artist Antoni Gaudí should get off at “Passeig de Grácia” and at “Vallcarca“. At the Passeig de Grácia you will find the Casa Mila (or La Pedrera) as well as the Casa Batlló, two of Gaudí’s most famous buildings. From Vallcarca there are escalators leading to the Parc Güell. This park above the rooftops of Barcelona was designed by Gaudí, belongs to the world cultural heritage and is completely crowded by tourists at the weekends.